If not a fellow traveller, today’s birthday belongs to someone who was definitely and definitively a traveller . 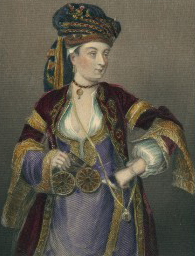 Hester Stanhope 12 March 1776 – 23 June 1839. Hester was delightfully eccentric. She moved from being hostess for her uncle, Prime Minister William Pitt the younger, via a dramatic shipwreck at Rhodes, to become an archaeologist, the first to use documentary evidence to plan her dig, and to use what we now recognise as modern archaeological methods – not just ransacking a site for its treasures. She behaved outrageously all over the Middle East, but somehow got away with it. (Unfortunately she’d been told by a fortune-teller that she would be the bride of a new messiah, and she took this seriously). She settled in what is now the Lebanon, and became respected as a (rather annoying) force in the land. She eventually got into financial trouble, but stuck it out, dying in the home she had adopted. Now would I want Hester at a party? I think so, provided she kept off her religious thing. She would have plenty of unlikely tales to amuse her fellow guests. This entry was posted in feminist, history, The Historical Birthday-Tea Party and tagged Hester Stanhope, History, Women Travellers by Cherry Potts. Bookmark the permalink.